Day 2 of the electronic dance music festival in Miami presented a huge lineup with big names like Afrojack, Tiësto, Aoki, Martin Solveig, Axwell & Ingrosso, Carl Cox, Dash Berlin, Above and Beyond, Cedric Gervais, and Nicky Romero among many more. Day 2 was an overall success. If you ask me where to start with Ultra Music Festival 2017 day 2 highlights, besides the music (of course), the fans who attended on Saturday deserve a shout-out. Ultra Music Festival’s flagship Miami event can only be known for one thing, let it be it’s diversity. People from all corners of the world showed up representing their own culture and happy to be in Miami to dance, have fun, make new friends, and be part of one of the greatest music experiences ever. The stages glimmered with massive lights and speakers making a voltage of noise on day 2 of Ultra Music Festival 2017 with over 40 music acts that started at noon. So Saturday was the perfect scenario to get your face smacked with the sound of the bass, let yourself go with the flow of progressive house or get trapped in the house and techno music out of the giant spider spitting fire into the sky. There were many great moments to talk about, so we will name here our Ultra Music Festival 2017 day 2 highlights, this way you can have an idea of what it was like. One of the best moments of day 2 came when Martin Solveig took the Ultra Mainstage. The host of the weekly radio show called C’est La Vie on radio stations worldwide played many of his famous works, including “Everybody”, “Ready 2 Go”, and “Hey Now”. It was also funny to see Sunnery James & Ryan Marciano sneak up on him on stage to interview him while on his set. Sunnery & Ryan were cruising Ultra from stage to stage doing field reporting before they jumped on their Resistance set by 7pm. That was awesome! I think it was a while since Aoki last came to Ultra, 2015 if I remember correctly. So it was good to catch up with his ever contagious “in pursuit of happiness”, and specially this year that he brought on stage 1/4 of One Direction, Louis Tomlinson. Undoubtedly one of the best performances ever at an Ultra Miami festival took place today Saturday. From 7:15pm and for the better of one hour, Tiësto drove the crowded insane, proving he is the greatest among the greatest. It was impossible for the rain to make the least dent. Tiësto nonstop played all possible great song he has ever made, guiding the ebbs and flows as a master he is. As LED light effects and pyrotechnics flashed from the stage, Tiësto was superb, and Ultra is really much more fun in the rain. The one and only Afrojack took the Ultra stage for his act at 10pm. What is like being at a live performance with Afrojack? He always makes it different. The global EDM phenom lit up the stage and had a fusion of hip-hop, R&B, Reggaeton and electronic dance. Afrojack has been doing EDM for such a long time and he really knows what he’s doing. He has said that “music has the power to broaden horizons”, so he remixed at Ultra Music Festival 2017 day 2 showing the potential of his new releases and collaborations. 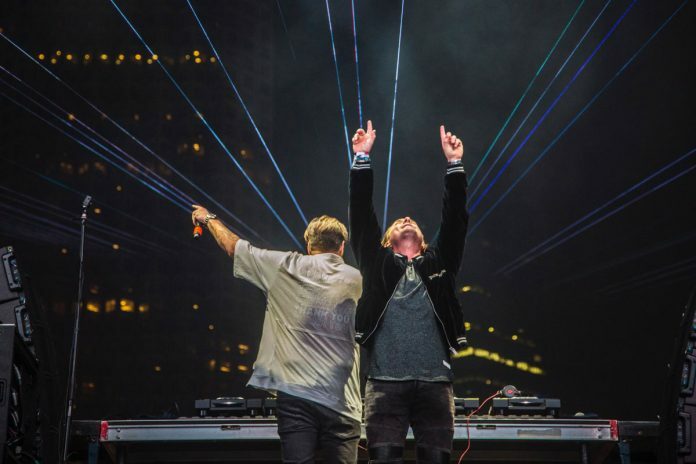 Axwell & Ingrosso, who are unquestionably one of the biggest acts in modern dance music, headlined the grand finale for Ultra Music Festival 2017 day 2. Being one of the most influential duos in the history of electronic dance music, Axwell & Ingrosso closed the night with a variety of old classics and new favorites. Andrea Helfrich interviewed them moments before their set and brought up questions fans were posting on Twitter using the hashtag #Ultra2017 where they spoke about how they get ready for each concert, specially the one in Miami that always carries so much expectations. Check Ultra Music Festival 2017 Day 2 Highlights and the Best Moments with Interviews, Photos, and Videos. In the Lineup, Afrojack, Tiësto, Aoki and more.